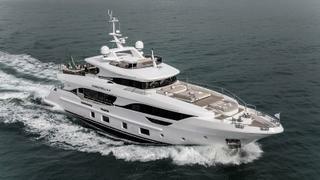 The first yacht in the Benetti Delfino 95 series Christella II, has been delivered to her Czech owner, following a handover ceremony in Viareggio. Built from GRP and carbon fibre to RINA standards, this 28.95 metre yacht features exterior styling by Giorgio Cassetta, while the modern interior décor was created by Petra Karaskova of Creativa Design working in close collaboration with the in-house team at Benetti. 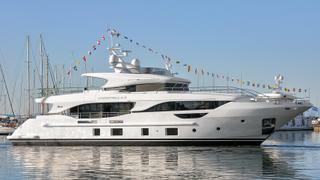 Speaking to Boat International, Cassetta added: "When you step on board you really see the modern details. The main difference is the windows — no parts are painted black, it’s all real glass with no joins." Christella II's layout is notable in that it allows the living spaces to flow seamlessly into one another. Materials used on board include Canaletto walnut woodwork, printed leather panelling and Eramosa marble, while British firm Aqualuce developed the lighting design. 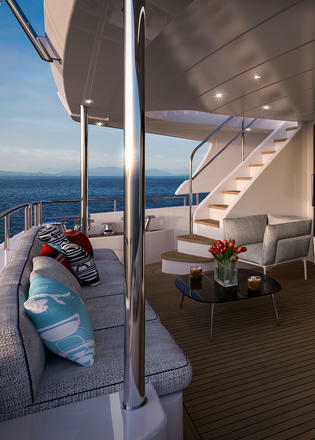 On board accommodation is for up to ten guests split between five cabins, including a full-beam master suite on the main deck that measures 21 metres square. Two interconnecting double rooms and two twin rooms are situated on the lower deck, while the crew quarters allow for a staff of up to five people. Key features on this raised pilothouse yacht include a 4.4 metre transom tender garage, two sundeck sofas, two spacious aft decks, and plenty of sunbathing space on the foredeck with the option to add a spa pool if desired. 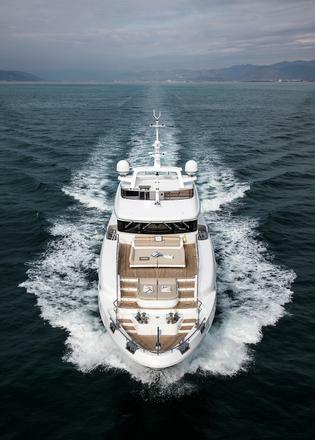 Power comes from a pair of 1,000hp MAN V8 engines for a top speed of 14.5 knots and comfortable cruising at 12 knots with electric stabilisers. 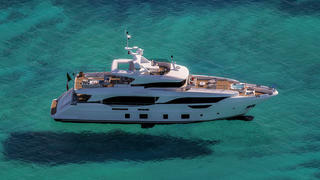 When trimmed back to her economic speed of ten knots, Christella II will boast a 2,400-mile range thanks to a total fuel capacity of 20,000 litres and a hull designed by Pierluigi Ausonio. 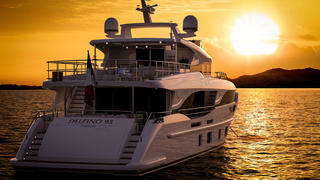 Other projects currently under development at the Italian yard include the Mediterraneo 116 series, another Cassetta design, with the fourth hull due to launch in 2019.